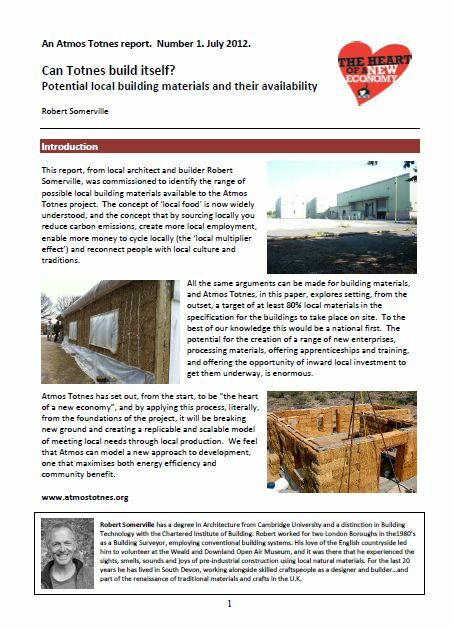 The report was written by building surveyor, building conservation specialist and teacher of natural building techniques Robert Somerville. It identifies the 5 principal materials that can be sourced within a 15 mile radius of Totnes as being crushed stone aggregate and sand, sub soil appropriate for cob walling, rough-sawn green timber, bales of waste sheep’s wool from Buckfast spinning mills and straw bales. It also explores the materials that could also be sourced from within Devon and Cornwall, the natural building materials available nationally, as well as materials that could be salvaged from the dismantling of the existing Dairy Crest facilities. The Atmos team will be seeking to design buildings which reach the highest standards of energy efficiency while also maximising the potential of local materials to revive and regenerate the local economy, and this report will form part of their brief to potential architects. “Atmos Totnes is about returning control over development in this town to its residents. It will be a community-owned development in which everyone will be able to invest. It is about maximising the social return to this community of the development that takes place within it, and the materials we choose to build with will be a key part of this. What we are modelling with Atmos Totnes is what localism means when taken to its logical conclusion. Totnes can lead the way here”. The report can be downloaded from www.atmostotnes.org/the-project/can-totnes-build-itself/, and the latest developments on Atmos Totnes can be found at www. atmostotnes or on Twitter at @atmostotnes. Downloadable MP3 files of ‘Atmos Voices’ interviews can be downloaded from http://atmostotnes.org/interviews/ and you are welcome to use any of them in any audio pieces you are creating. However, I’m concerned about the overall design process…will there be community led design workshops using “Planning For Real”? Maybe I’ve not read the fine print, but at the moment the plans give the impression that housing layout and design has been settled already. Reading ‘Can Totnes build itself?’ on page 4, the claim that airtightness products are delivered on over-sized lorries is incorrect. Modern day logistics may lack systems resilience but inefficient they are not. Any compentent logistics manager will plan to avoid using inappropriately sized vehicles. While it is true that some airtightness products are made from fossil fuels, they represent a tiny proportion of the mass and volume of material used in a building, and in any building that claims seriously to be addressing energy use, such products make a much larger proportionate contribution to reducing energy use, at lower cost energetically or financially than simply adding further and further to insulation. The marginal extra cost in embodied energy and carbon incurred by using airtightness products can be off-set by using Passivhaus energy modelling (PHPP) to optimise the design of the building to minimise unnecessary use of building materials. Even if a project is aiming for the building fabric performance standard required for “zero carbon”, rather than the more stringent Passivhaus standard, modelling the design in the PHPP will allow much more informed decisions to be made (and from that money, energy and carbon savings). The economy in Totnes seems to be mainly built on its status as a worldwide distribution centre for legal highs and synthetic cannabinoids. Is this the future for the town?